It is amazing how quickly the optimism of pre-season evaporates. After three seasons of toil and struggle, resulting in relegation from the Blue Square Bet South last season, we headed up to Suffolk on Saturday expecting a change in fortunes. And then we came home again with that same sinking feeling of defeat, failing to get out of first gear against a team who will undoubtedly be challenging for promotion come what May (or April). But 100 hours is a long time in football, and so the optimism had crept back this week with the anticipation of the first home game of the season. For me it also meant much more. This was my first game as an owner of a football club. My football club. Community ownership in football clubs is the new evolution, and it is starting from the ground upwards. FC United of Manchester, AFC Telford United, Runcorn Linnets and Halifax are all other examples of clubs in the Non Leagues getting it right. AFC Wimbledon have now moved into the Football League, joining Exeter City and then there is the success at Swansea City, who are part Community owned. Is it any wonder that confidence of a good season on the pitch at Lewes follows the success of the change in ownership model off the pitch. Less than 80pence per week and you too could be walking through the gates proudly sporting your owners badge. 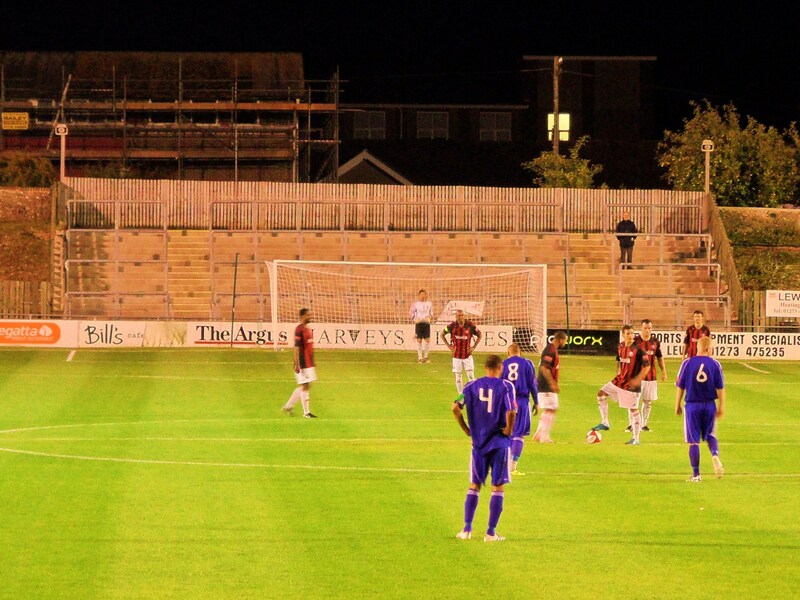 Three years ago, Lewes’s first home game of the season was a “local derby” versus Crawley Town in the Blue Square Conference. Time can be a cruel mistress. This week Crawley Town were away to Crystal Palace in the Carling Cup, a brief distraction from the Football League Division 2 where they sat top of the table. 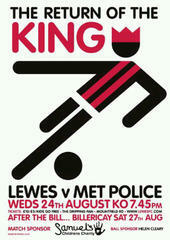 Lewes on the other hand have moved the other way and now had a home tie with the Met Police to look forward to. Who wants to play at grounds like Selhurst Park anyway. I was also excited as I would be joined by CMF for this game. As we were still sans children we decided to relive a bit of our youth with a meal out and then a football match. A night out with Deaks and Dave took us back to those barmy nights in Kos when we first met. 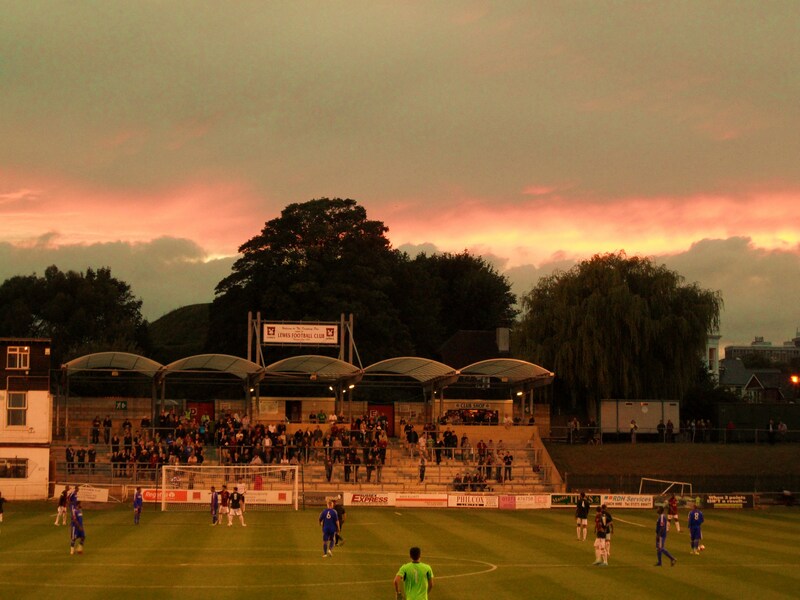 Lewes 1 Met Police 0 – The Dripping Pan – Wednesday 24th August 2011 Let’s dispel a myth before all of the fun starts. You no longer have to be a serving policeman to play for the Met Police team, so there is no fear of retribution in the form of a search warrant for a mistimed tackle or over eager shoulder charge. The other apparent downside of being the “official team” of the police is away support is a bit thin on the ground. In fact we officially classed the away following as one, although that may have been a bit harsh, as Danny Last pointed out, some may have been “undercover”. Pre-match excitement came from somebody who said they saw Kenneth Brannagh in the ground. What deluded fool thought such a thing? I ask you! (For the record, he does look bloody like Ken). Once that little issue was sorted it was on to the BIG pre-match news. Homemade Chicken and Ham pies were on the menu. I’m sorry but Pukka pies may be, well, “pukka”, but these beauties were tip top. Worth the admission price alone, said one of the stewards, who of course didn’t have to pay to get in anyway. It was good to see so many members sporting their badges including The Guardian’s own Paul Hayward and Come Dine With Me’s Dave Lamb on the terraces, and of course the Harveys Best was as good as ever. All we needed now was a performance on the pitch. Steve King was still serving his touchline ban so took his seat a good 10 feet away from the dug outs in the main stand. But he had obviously been unhappy with the performance on Saturday so he started with a more conventional 4-4-2 with the dangerous Ciardini on the left and Paul Booth up front. The first half ebbed and flowed with no real clear cut chances, apart from an optimistic lob from Small in the opening minutes that just bounced over the bar, and a heart in the mouth moment when Williams ventured out of his area and blocked a Met Police forward. The referee hadn’t made many friends already in the ground and a few thought that a red card may be forthcoming but fortunately it wasn’t so harsh. Just on the stroke of half time the opening goal came when Booth’s boot met perfectly with the ball on the edge of the box and his volley sneaked into the net. The second half was not a classic, with both teams threatening to create something but ultimately failing. Lewes had a great shout for a penalty when Ciardini was tripped, although the referee must have been unsighted based on Mr Boyes’s photo to the right. Met Police also had a good shout for a spot kick, although it was only fair the referee missed that one as well. With five minutes of injury time held up, our thoughts went back to games such as Dartford last year when we threw away 3 points, but this team seems to have a bit more belief and concentration. Full time whistle, three points, thank you very much. My football club had won! Roll on Saturday and the visit of Essex’s finest, Billericay Town.